The red and blue circles are the locations of the galaxies orbiting Andromeda. Just looking at them on the sky doesn't seem to reveal any structure, but remember, with the distances, we have the full 3d distribution. But even in 3d, there doesn't appear to be any particular substructure. So then lead author, Rodrigo Ibata, and the rest of us ask "what if there is substructure in a subsample of the galaxies?" As you can imagine, with a sample of 27 galaxies, there 27 configurations of 1 galaxy, and 1 configuration of 27 galaxies, but how many subsamples of say 15 galaxies are there? This is given by the binomial coefficient, and the answer is "A lot!" (well, 17,383,860). And so we set out to test each subsample, comparing their distribution of random samples of 27 galaxies. Quite clearly, the edge of the plane appears to be pointing straight at us!! But what are those arrows doing in the picture? I've also written previously about our measurements of the velocities of all of the dwarfs (there are actually several teams doing this) and so we know how fast things are moving. 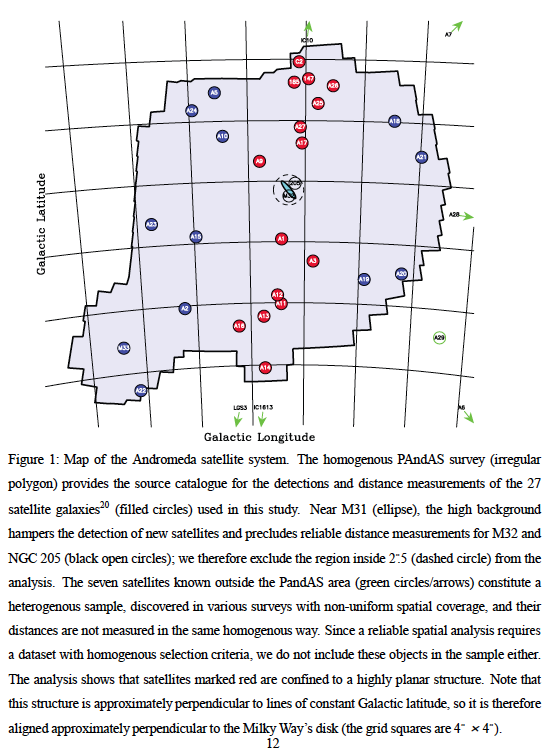 And what we find is there is velocity structure in 13 of the 15 galaxies in the plane; all those north of Andromeda are coming towards us, and all of those south are moving away. It look like the plane is rotating! As that sinks in, watch this movie. As an aside, the music is being played by Neil Ibata, a coauthor on the paper; not bad for a 15 year old (as you might guess, he's the son of the lead author of the paper). And these authors have asked "Do the Milky Way's companions spell trouble for dark matter? 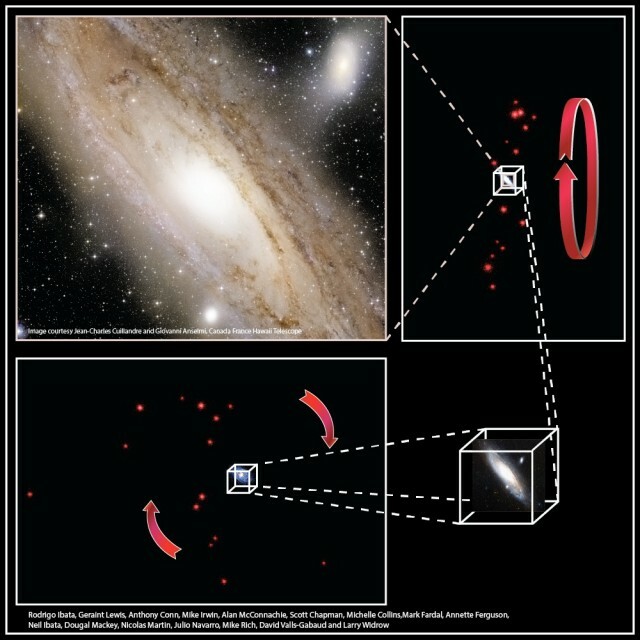 ", and you can read their take on our paper at Marcel S Pawlowski's blog (although some may claim these views are a little closer to the fringe than standard cosmology). Dwarf satellite galaxies are thought to be the remnants of the population of primordial structures that coalesced to form giant galaxies like the Milky Way. An early analysis noted that dwarf galaxies may not be isotropically distributed around our Galaxy, as several are correlated with streams of HI emission, and possibly form co-planar groups. These suspicions are supported by recent analyses, and it has been claimed that the apparently planar distribution of satellites is not predicted within standard cosmology, and cannot simply represent a memory of past coherent accretion. However, other studies dispute this conclusion. 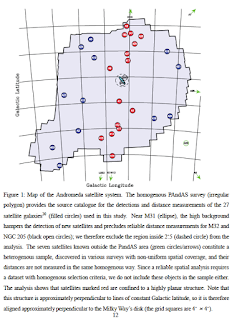 Here we report the existence (99.998% significance) of a planar sub-group of satellites in the Andromeda galaxy, comprising approximately 50% of the population. The structure is vast: at least 400 kpc in diameter, but also extremely thin, with a perpendicular scatter <14.1 kpc (99% confidence). Radial velocity measurements reveal that the satellites in this structure have the same sense of rotation about their host. 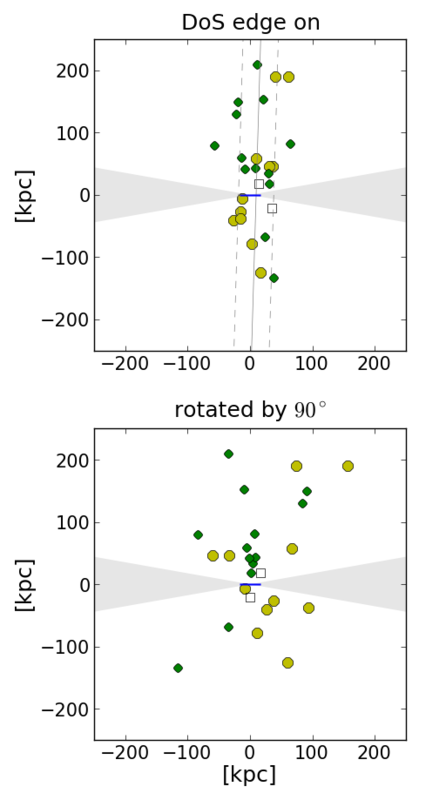 This finding shows conclusively that substantial numbers of dwarf satellite galaxies share the same dynamical orbital properties and direction of angular momentum, a new insight for our understanding of the origin of these most dark matter dominated of galaxies. Intriguingly, the plane we identify is approximately aligned with the pole of the Milky Way's disk and is co-planar with the Milky Way to Andromeda position vector. The existence of such extensive coherent kinematic structures within the halos of massive galaxies is a fact that must be explained within the framework of galaxy formation and cosmology. Congratulations on the Nature paper, it is a spectacular discovery. And thanks for mentioning my blog post. I'm not quite sure where this "fringe" starts, but I would argue that tidal dwarf galaxies are not that non-standard given that they are observed in the universe. Anyway, I agree that it will be fun to find out what is going on in these satellite systems and I look forward to the upcoming discussions on this issue. Don't worry, I didn't think that you used the word in such a negative way. Yes, the tidal scenario is certainly not the mainstream view yet, but your work does indeed support it in my opinion :-). I hope that these issues are going to be discussed more openly now (both among scientists and in the literature), and then we'll see how things will develop. There is a lot of work to be done during the next years. A spectacular discovery about our neighbouring galaxy. Did it line up 2 billion years ago? Will it line up with us in two billion years time? If fifteen of them line up in our direction, do the other fifteen line up in any other direction, or are they more random? Does the VPoS around the Milky Way align with M31? The options are - either it is an extremely rare coincidence (which no one really like) or its origin is not as we expected (which means there is more to do - more bread on the table). If it is coherent, then yes, it may well have been there 2 billion years ago, and 2 billion years hence, but if it is a chance alignment, it may be gone. Brent Tully, who wrote the News and Views part of the Nature report, thinks the others are on planes also - so it might be several planes. This would be *very* unlikely to happen by chance, and extremely strange.